Almost immediately after the EVE doors opened active region 11057 provided some fireworks and let loose with 4 C-class flares! 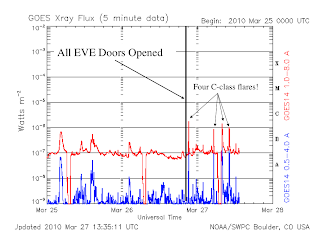 Here is a graph from the NOAA SWPC in Boulder, CO showing the GOES X-ray fluxes. 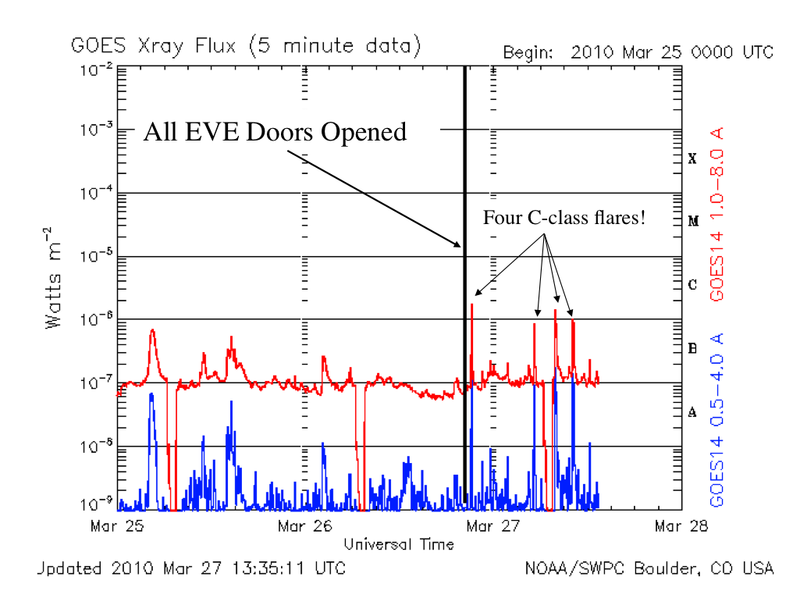 The EVE doors were all opened by 19:43 UTC, and the flares started at 21:08 UTC. EVE will study the energetics of such flares while HMI and AIA tell us how and why they form. Welcome to Solar Cycle 24. At 3:43 pm ET all four EVE doors were open. HMI and AIA were able to measure the jolt of the doors. 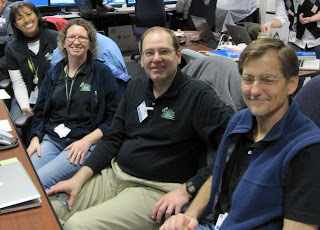 Here is the EVE team in the MOC after the doors opened. Congratulations EVE. AIA doors are to be opened tomorrow. EVE team members at Goddard getting ready to open the EVE doors. Go EVE, let the Sun shine in! Thursday was spent testing the "jitter" of the observatory. Why do we care? SDO needs to keep its imaging telescopes pointed at the Sun with a steady hand. Our pixels image an area of the Sun that is about 0.5" across. While that's a patch the size of New Mexico on the Sun, it easier to think of it in terms of a quarter. If you ran to the top of the Washington Monument in Washington, DC and held up a quarter, your friend would have to stand on the Wilson Bridge (6 miles away, waiting for the drawbridge to be lowered) to make the quarter look 0.5" across. Imagine how steady they would have to hold the camera to take a picture. SDO must keep the cameras pointed that accurately while moving around the Earth, keeping the high-gain antennas pointed at New Mexico, and with all the motors running to move filters and shutters in the instruments. It's good to do jitter tests! 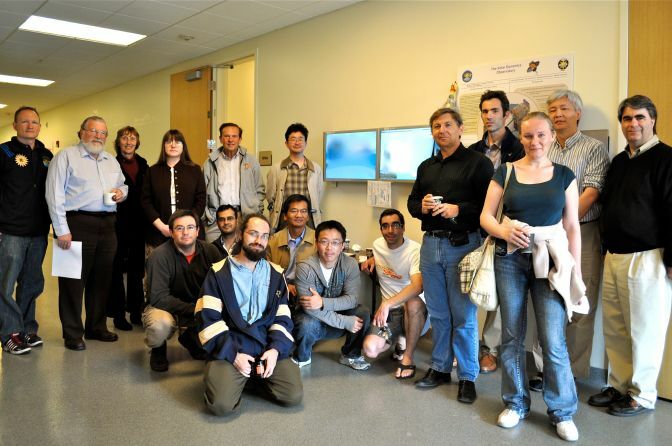 During the HMI door opening a large part of the HMI team was at Stanford. Here they are celebrating the successful door opening and our first chance to see what the HMI instrument will do for solar studies. At 11:00 am EST this morning HMI began opening their door. This door protected the front window and optics from damage but can now be opened to let the Sun shine in. Sunlight was used to illuminate the front window and study the optical performance of the telescope. A sunspot could be seen in these engineering images. Noon: Here are the HMI team members who did the commanding in the MOC, congratulations HMI! This morning the HMI door will be opened. Engineering images to test HMI will begin to flow. These will start with pictures of the door opening that allow the HMI team to study scattered light inside the instrument. 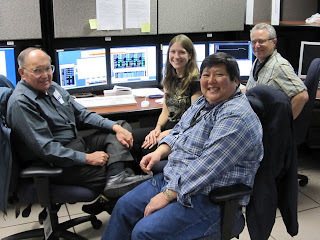 The instrument teams of SDO began their work to start taking data. HMI allowed its CCDs to cool over the weekend and EVE started the cooldown cycle on Tuesday. AIA plans to watch the Sun while their CCDs cool to operational temperatures later this week. The Ka-band transmitter was turned on and high-rate (150 Mbps) data is flowing to the SOCs. Friday was a day to run in science mode. SDO ran all three instruments over night with test patterns. The EVE instrument completed its component check outs. HMI prepared to turn off the decontamination heaters on Saturday to allow the CCDs to get cold. AIA worked with their guide telescopes and image stabilization system. AIA'S GTs tell us where we are pointing with great precision and they are important to test. 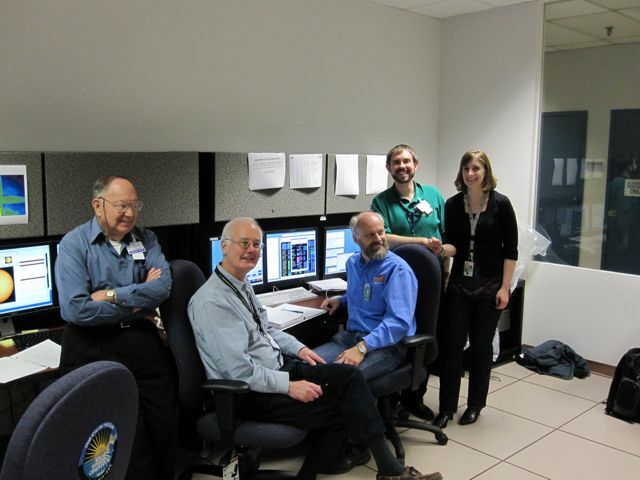 SDO continues to operate well. Another longer eclipse will happen tonight and an antenna handover will be done. morning. Their dark data look fine. Every component looks healthy. Congratulations and thanks to the EVE team and GSFC SDO project team !!!!" Wednesday was a very good day for the SDO observatory and team. The Ka-band transmitter was turned on, the antennas pointed at the ground station, and data started to flow. Both ground antennas locked immediately and had good signal strength. HMI and AIA generated test pattern data, which was transmitted to the ground and forwarded to the JSOC without any errors. The SDO team is now working with the antennas to make sure they track the Earth with one rotation per orbit. This allows us to send 150 Mbps to the ground. So far the Ka-band system is looking great! GO SDO!! The third Trim Motor Firing (TMF #3) was successfully completed Tuesday evening. This apogee burn raised our perigee to geosynchronous with an orbital period of one day. SDO is on station, next is to start up the instruments! How does SDO know where it is pointing? Seems easy, just point at the brightest object in the sky! But what about our roll angle around the Sun, or where is the Sun's North Pole? SDO uses star trackers to measure its attitude. 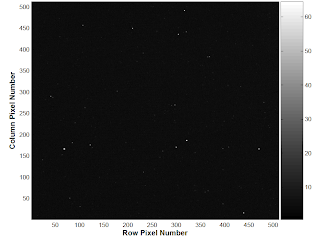 CCD images (like this one) are compared to a library to see where the star tracker is pointed. Once we know where the star trackers point we can figure out our roll angle on the Sun. TMF-2 Complete, On to TMF-3 and Final Orbit! Trim Motor Firing #2 was successfully completed this morning. This was different from our previous burns in being a perigee burn to raise apogee. The final orbit trim maneuver, TMF-3, is scheduled for Tuesday evening. It will be an apogee burn to raise perigee to geosynchronous and our period to one day per orbit. SDO will see a lunar transit (the moon passing between the Sun and SDO) tomorrow morning starting at 7:22 am EDT. It will last over 3.5 hours but will not be seen on the Earth. The first Trim Motor Firing (TMF #1) was successfully completed Thursday evening. This apogee burn raised our perigee to 35,300 km, an orbital period of 23.6 hr. This means we are drifting 6 degrees to the east in every orbit. Two more thruster burns will be done, TMF #2 is a perigee burn to raise the apogee to its final value and TMF #3 is an apogee burn to raise the perigee to its final value. Our eastward drift will also be stopped and we will orbit the Earth once per day at the longitude of New Mexico. Tuesday night the main engine fuel and oxidizer lines were vented. SDO will now fly on thrusters for orbit station keeping and momentum control. 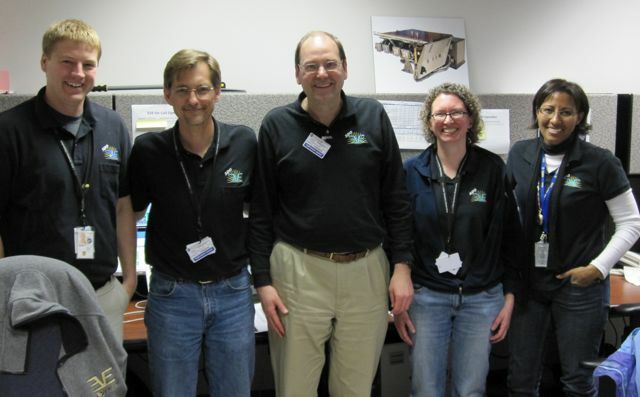 Many thanks to the SDO propulsion team for building SDO's bi-prop system, the first to be designed and built at Goddard. Our next orbital maneuver (TMF #1) is scheduled for Thursday evening. Apogee Motor Firing #8, the last orbit raising maneuver, was successfully completed Monday night. This burn raised the SDO perigee altitude to about 34,600 km for a period of about 23 hr. With this orbit SDO will appear to drift eastward toward our final longitude. Now that we are close to our final orbit the main engine plumbing will be vented to exhaust fuel and oxidizer from the lines. The first Trim Motor Firing (TMF #1) is planned for Thursday evening. A successful Apogee Motor Firing #7 continued the string of smooth Main Engine burns since we removed the structural filter and lengthened the settling burn. AMF-7 raised our perigee altitude to approximately 25000 km, giving SDO an orbital period of about 19.2 hours. This sets SDO for one last trip "around the world" before Monday's AMF-8 actually moves SDO into a nearly geosynchronous orbit. After AMF-8, there will be three additional Trim Motor Firings (TMFs) to fix our operational orbit over White Sands. Here is the SDO orbit so far. 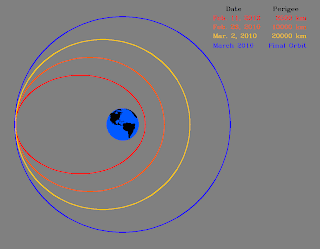 The initial GTO, two intermediate orbits, and the estimated final orbit are shown to scale. Apogee Motor Firings (AMFs) all take place at the apogee of the orbit (the left side of the diagram) and are designed to lift the perigee (where SDO is closest to the Earth) up to a geosynchronous altitude. A few trim maneuvers will then move SDO into its final orbit. Perigee values are altitudes (height above the Earth). Apogee Motor Firing #6 was successfully completed Tuesday evening. The burn used about 6 minutes of ACS thruster firing and 13 minutes of Main Engine firing. This maneuver raised the SDO perigee altitude to about 20,100 km, or a period of 17.4 hr. The GNC team reported that the Main Engine burn was extremely quiet and the momentum disturbance due to the fuel sloshing was minimal. Due to the equipment outage at the Santiago ground station, most of ranging this evening was performed by SDOGS. Apogee Motor Firing #5 used the ACS thrusters and main engine to raise the perigee altitude of SDO to about 15,000 km on the way to our target of 35,800 km. (Using Kepler's law, my estimate of the current orbital period is about 15.4 hr.) We had a very smooth burn so we will use the main engine for the next burn that is scheduled for Tuesday evening. Thanks to the slosh tiger team for their hard work on redesigning the flight software!